Taoiseach Enda Kenny has said his successor Leo Varadkar will have his full support, but he has no concrete plans for his own future. 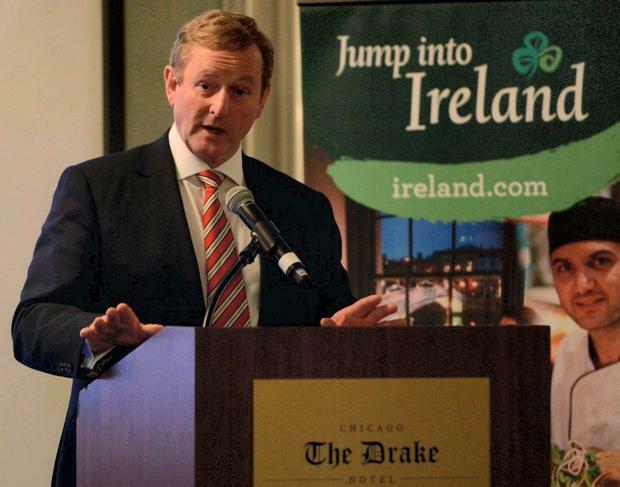 Mr Kenny was speaking during a two-day trip to Chicago, where he said Mr Varadkar needed to get on with the job of "moving the country forward". After attending a U2 concert on Sunday, he joked that "he still hasn't found what he is looking for". Mr Kenny said: "Obviously my intention is to stay as a deputy until the Dáil is dissolved, but in the new government, and hopefully Minister Varadkar will be elected as Taoiseach, hopefully get on with the business of moving the country forward. There are still challenges up ahead and I am very happy myself, both personally as a citizen and as a politician that happens to be Taoiseach, to move the responsibility on to the next generation." Mr Kenny met relatives of Michael Collins yesterday and was presented with a commander's cap and a rosary belonging to the Cork man.